2008 Missouri Republican primary county map. The 2008 Missouri Republican Presidential Primary on February 5, 2008 determined the recipient of 55 of the state's 58 delegates to the Republican National Convention in the process to elect the 44th President of the United States. It was an open primary. John McCain won a slight plurality of the vote, receiving all of Missouri's delegates. 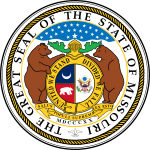 ^ "Official Election Returns - State of Missouri Presidential Preference Primary". Missouri Secretary of State. 2008-03-07. Retrieved 2008-05-24. ^ "RESULTS: Missouri". CNN. Retrieved 2008-02-05. ^ "Feb 5, 2008 Presidential Preference Primary : Election Night Map". Missouri Secretary of State. 2008-02-05. Archived from the original on 2008-02-07. Retrieved 2008-02-08. This page was last edited on 14 December 2018, at 18:00 (UTC).